Here you will see all the great sites on the internet, all about zombies. We have searched the internet high and low to find these sites, some sites we contact get great responses from. If you know of any cool zombie, undead, horror sites email us at. flashzombies@yahoo.com Every link on this page opens up a new window, so turn off pop up blockers. Thanks and enjoy! Check out our exclusive interview with the shows creator. Zombie Pirates is a series of stop motion short cartoons based around immortal zombie pirates who are looting all of the merchant ships at sea. Developed by former members of Bungie Studios members and utilizing the Halo 2 engine, Stubbs the Zombie "Rebel Without a Pulse" delivers a stirring tale of one man's hunger for love, justice...and brains. Currently coming soon to a Xbox near you. 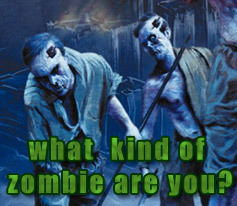 Find out what kind of zombie you are? From George Romero Zombie to a Fulci Zombie, even a Resident Evil Zombie.